CONGRATULATIONS to Cian McPhillips, Longford AC, who ran an exceptional race on Saturday February 2nd in the Senior Men’s 1500m at the AAI Indoor Games held at the National Indoor Arena in Abbottstown to set a new Irish Youth (U18) record at 3:46.42 minutes. This exceptional achievement sees 16 year old Cian shave 8 seconds off his CBP of last Sunday at the National Junior Indoor Championships in Athlone to become the new Irish Boys Youth Indoor record holder, wiping off Ciarán Ó Lionaird’s 14 year old record time of 3:50.86, held since January 2005. Cian has already achieved the U18 qualifying standard for the European Youth Olympic Festival (EYOF) that will be held July 2019 in Baku, Azerbajan for athletes born 2002 or 2003. His new Irish record time ranks Cian as World number 1 in the U18 Men’s 1500m so far this year. 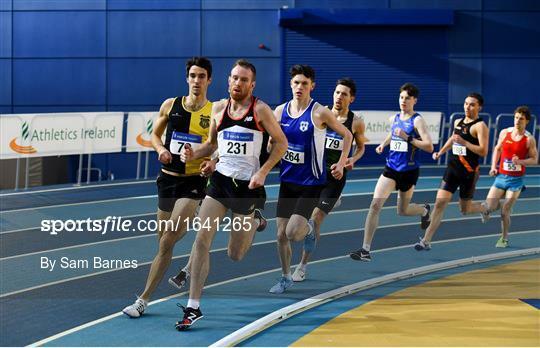 “Back at home, arguably the most impressive performance at the AAI Indoor Games at the National Indoor Arena on Saturday was Cian McPhillips setting a new Irish Youth 1,500m indoor record of 3:46.42, finishing fifth behind senior John Travers.